Broomgrass is a perennial, high value, non-perishable, nontimber forest product (NTFP) that grows abundantly in degraded, steep or marginal land. 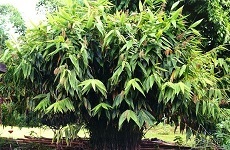 The panicles of this multipurpose crop are widely used for making brooms. 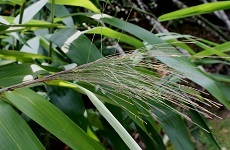 Broom grass has an important ecological and economical role for hillside dwellers. It’s non-perishable nature makes broomgrass a suitable cash crop establishing high market demands. Maize popularly known as ‘Corn’ is the most versatile emerging cash crop having wider adaptability under varied climatic conditions. Corn which is also termed as ‘Queen of cereals’ grows throughout the year and is of high nutritious value . Maize or corn serves as basic raw material for thousands of industrial products that may include starch, alcohol beverages, pharmaceuticals, cosmetics, package and paper industries etc. In Assam, a sufficient quantity of Maize is produced developing a considerable market demand. 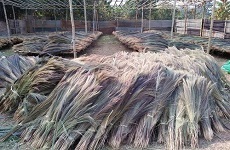 Hill broom which grows abundantly in the hilly regions of Assam can be promoted into sustainable livelihood option of the SHG members as it involves very low investments and has high tolerance to harsh environment conditions such as shallow soil, drought and heavy rainfall minimizing risk involved in this cultivation . The SHG members can yield good income with this cultivation and thereby enhance additional household income. Promotion of Producer Groups and Producers Company. Capacity building of the Mission Staff and Producers Group and Community level. 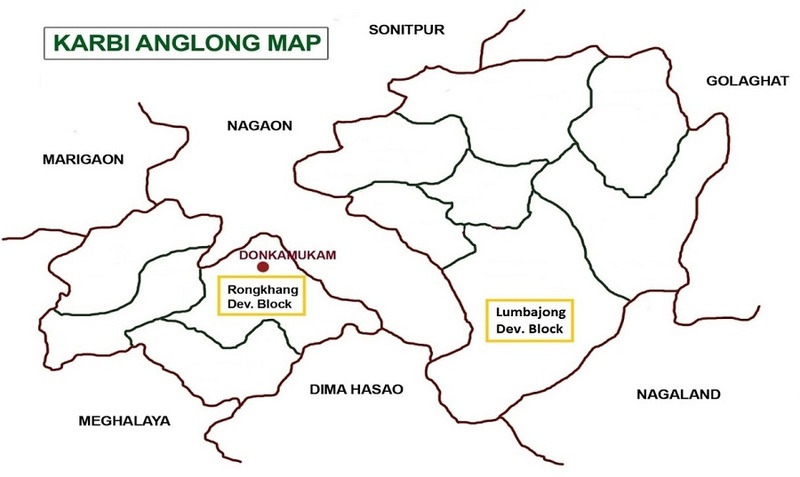 The project is in Rhongkhang and Lumbajong blocks of District Karbi Anglong with an estimated coverage of 1000 SHG households in Collective aggregation & Broom Manufacturing and 1400 SHG households in Collective Aggregation and marketing of Maize. The value chain intervention proposed for hill-broom would focus on addressing the critical gaps identified in harvest and primary processing practices of the community through Focus Group Discussions (FGDs). 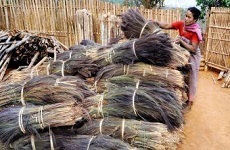 Intervention Area: The proposed value chain intervention on processing of raw hill-broom into brooms is planned in two clusters, namely Amlongsarpo and Kopiliclusters of Rhongkhang block of District Karbi Anglong in Assam. Household Coverage: Under the proposed intervention, there is potential to cover 1000 households in two clusters, Amlongsarpo and Kopili of Block Rhongkhang of District Karbi Anglong. 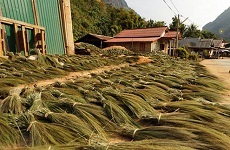 Raw Material Procurement Plan: There is potential to source raw materials from 1000 households engaged in cultivation of hill-broom in two clusters, namely Amlongsarpo and Kopili of Rhongkhang blocks of District Karbi Anglong. 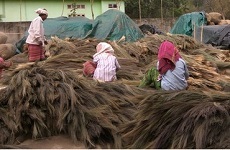 In business plan, the procurement price of hill-broom grass is set at INR 31/kg. 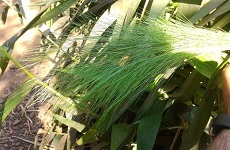 Product Mix: The targeted product mix is 20:80, with around 20% of the raw hill-broom grass procured by Producer Company being processed into brooms and 80% being sold as raw grass to wholesalers and processors. Establish producers group at village/cluster /block level and one Producers Company at central level. Preparation of implementation action plan. Preparation of Business model for Producers Company and implementation of the same. Institutional Building of Producers Group and Producers Company. Marketing support in marketing,buyers identification market linkage etc. Capacity building at different level of ASRLM staff, Community members, Producers Organisations office bearers on Producer Group Management, Maintenance of Books of Records and Business Operations, besides hands on training on harvesting, drying , cleanings and processing. 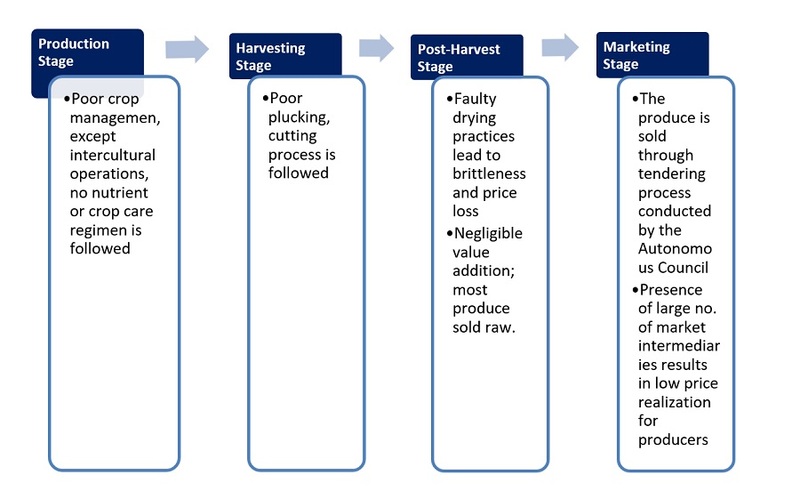 Development of Package of practice (PoP) for production enhancement. Identification of Primary Producers and formation of Producers Groups (PGs) as per the approved product line. Assist the PGs in identification of representatives/Directors in forming the Producer Company (PC). Facilitating partnerships development/linkages/convergence with key knowledge/technology institutions, private firms, marketing institutions and traders.